Bank Negara Malaysia (BNM) today May 23, 2011 announced that a new design series of banknotes and coins will circulate in Malaysia in early 2012. The new banknotes will replace Malaysia current paper money. 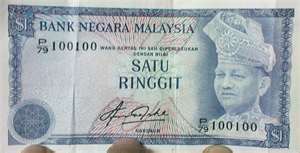 Here below is the paper money used in Malaysia in the early 1980s. The present generation may not have seen this bill. But this is the currency used in the form grandmother, grandfather, father and our mother in the past. During the Japanese occupation in Malaya and Borneo World War 2, the currency used was banana leaves notes. 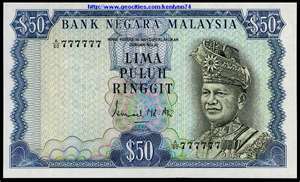 According to Bank Negara, the introduction of new banknotes was done on a periodic basis in each period of 12 years. 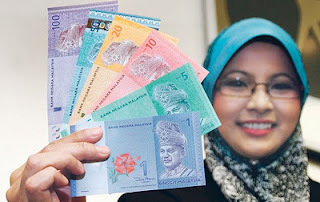 "The design of the new series of currency will contain features that are peculiar to Malaysia," the central bank said in a statement Wednesday May 23, 2011. Series of notes, he said, has security features a more sophisticated line with recent technological advances of this bill. The design of banknotes of the fourth series of the new banknotes are in denominations of RM1, RM5, RM10, RM20 and RM100. Latest design RM50 notes already in circulation since December 2007 to commemorate the 50th Anniversary of Malaysia's Independence will continue to remain in circulation. It also introduced a new form of coins 5 cents, 10 cents and 50 cents.